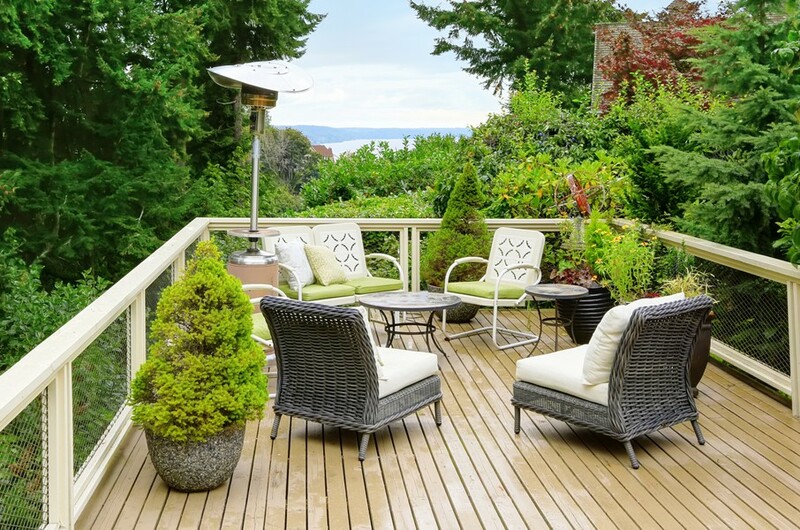 A patio or deck is a great place to entertain or just hang out and relax when the weather is nice. When cold weather starts creeping in, you probably abandon your outdoor space for the warmth of the indoors. A patio heater can help prolong the time you spend outside and extend the season for outdoor enjoyment by a month or more depending on your location. In addition to providing warmth, patio heaters make a great focal point and add a certain ambiance to a space. If you’re thinking about buying an outdoor patio heater, the following guide should help you select the style, fuel type, and size that’s best for your outdoor space. 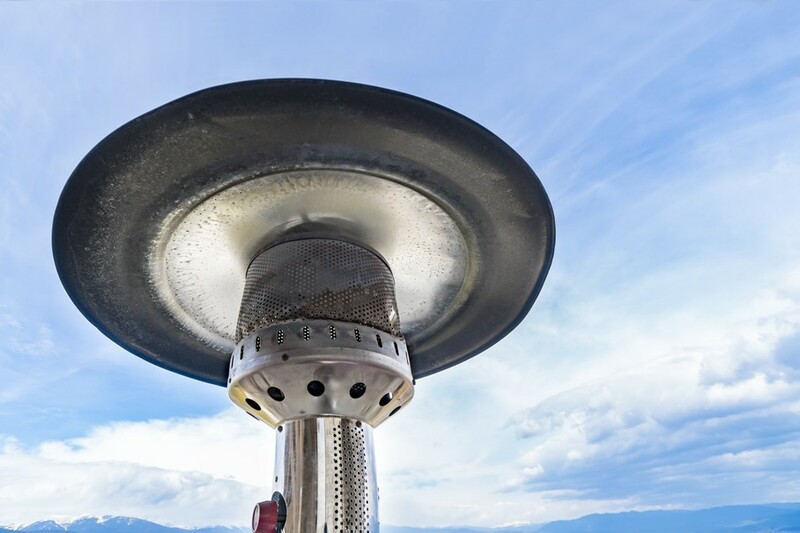 A patio heater produces heat by burning fuel, such as natural gas or propane, or by an element that heats up from electricity. The heat is then intensified by the design of the heater and warms the space under and around it. Unlike a space heater that uses a fan to blow hot air, a patio heater acts more like the sun and produces radiant heat. This method works best for outdoor spaces as it keeps the heat in one spot. Anyone standing under or near the heater will feel the warmth. The idea is to take the chill off, not heat up an open space. 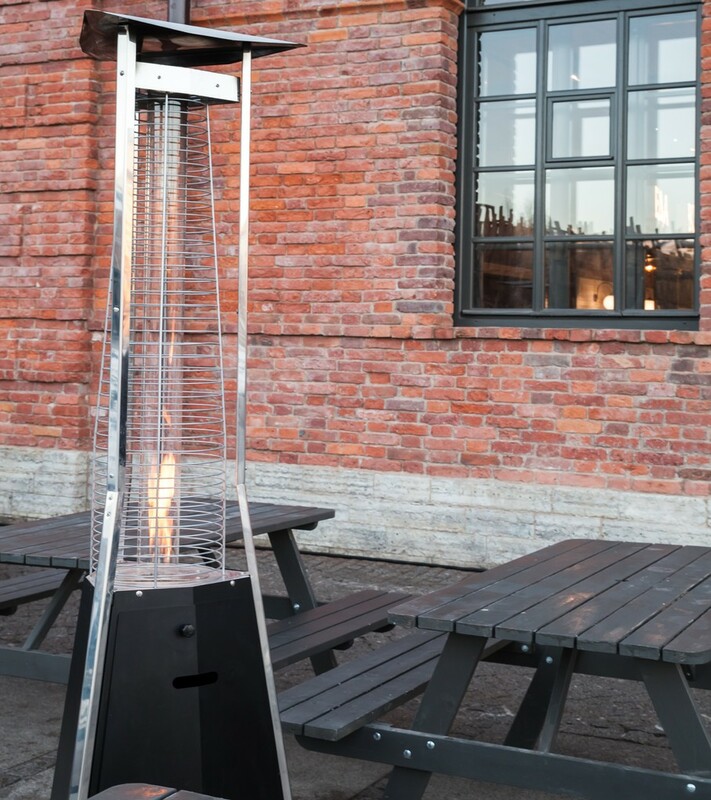 A full-size freestanding patio heater has a heat radius of anywhere from 5 to 20 feet depending on the model. What are the Best Fuel/Power Source Options? Outdoor patio heaters require some sort of fuel or power to produce heat. The most common is propane, followed by electric, and lastly natural gas. Each option has its advantages and disadvantages. Much like a gas grill, a propane patio heater runs off a propane tank that sits in the base of the heater. A propane heater is one of the most economical to operate for the amount of heat that it generates. 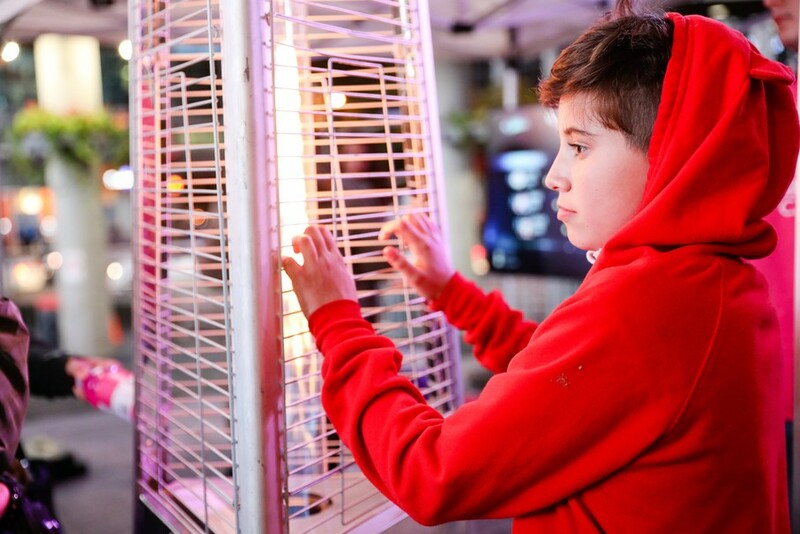 Freestanding and tabletop heaters can be placed in the center of the patio or deck and produce enough warmth to keep a small group of people comfortable. The only disadvantage is that the propane tank must be refilled or replaced when it runs out. There are no installation costs associated with propane, but it does have the highest cost of use. Electric patio heaters are often wall mounted, but there are some freestanding models. They are more efficient than propane in that 100% of the energy consumed is converted to heat. Electric patio heaters are very easy to use, and most require little more than a standard outlet. Once mounted, they will produce just as much heat as a propane model. The downside is that they are not portable and people must sit under or near the units to feel the warmth. There’s also no flame to gaze at. Freestanding models can be moved to wherever there’s an outlet. Electric patio heaters operate very efficiently at a cost between propane and natural gas. Natural gas heaters are similar to propane heaters but must be connected to a natural gas line which makes them stationary. Much like an electric heater, people must congregate under or near the heater. The advantage of natural gas is that you don’t have to replace a tank. The disadvantage is that you can’t move the heater once it’s hooked up and you may need to hire a plumber to install the gas line. Patio heaters that run on natural gas have a lower cost of operation than any other patio heaters. 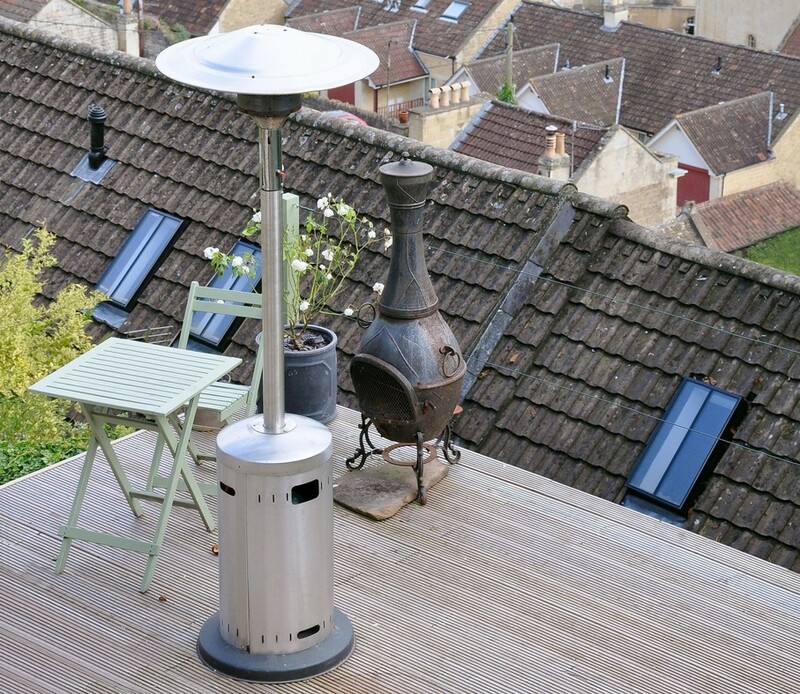 What Size Patio Heater Should You Get? Freestanding patio heaters typically produce 40,000 BTUs per hour. This will heat a 20-foot diameter space which is good for a medium size crowd. A tabletop heater will produce around 30,000 BTUs depending on its size, and 30,000 BTUs will heat a radius of 5 to 8 feet. Wall-mount heaters can generate 10,000 to 30,000 BTUs depending on their size. The larger the BTU rating, the larger the heat radius. If heating with propane, a large BTU output will mean having to change the tank more often. A 20-pound tank can support 40,000 BTUs for approximately 12 hours. The temperature of the air and wind conditions can also affect the heating ability of the heater. The heating area is based on relatively low humidity, a temperature of 55 to 65 degrees, and very little wind. 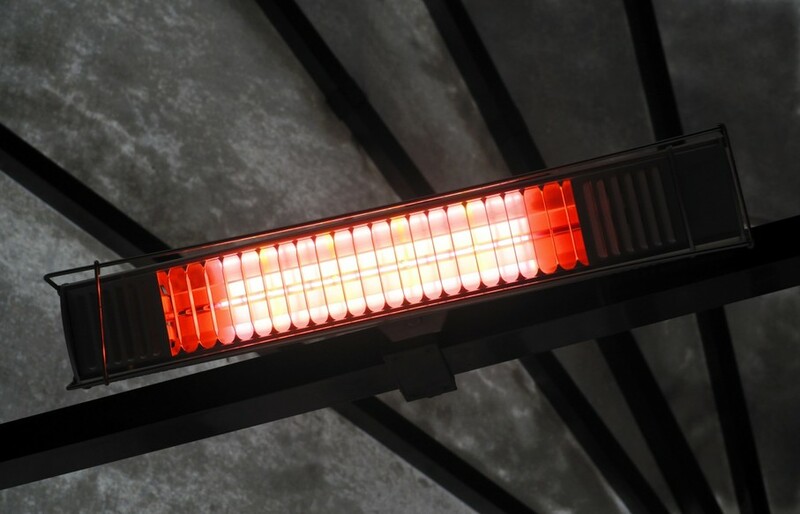 Patio heaters don’t work well in the winter when the temperature dips below 40 degrees. There are several types of patio heaters on the market, and each has its pros and cons. Freestanding heaters are the most common kind of outdoor patio heaters. They are powered by propane, natural gas, or electricity and feature a heavy base where you can place the propane tank so it’s out of the way. They are tall and thin and feature a hooded top that radiates the heat back to the ground. The require a clearance height of at least eight feet. They are sometimes called mushroom heaters because of their design. The flame is located under the hood and glows red or blue depending on the fuel source. If electric, an element heats up and glows red. Propane freestanding heaters are portable and usually have wheels on the base so they can be moved to wherever is most convenient. A tower heater is a type of freestanding heater that has a flame in a cage that’s located near the base of the heater. The top of the heater is designed to intensify and radiate the heat downward. Tower heaters don’t put out as much heat as a mushroom style heaters but are more fun to watch. 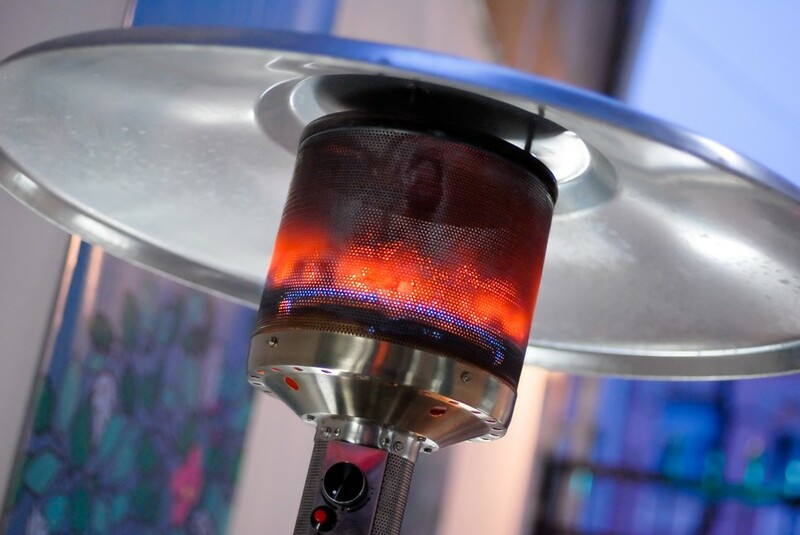 Freestanding heaters are ideal for open outdoor decks and patios with lots of space. Tabletop heaters are made to be placed on a table or other sturdy object. They may resemble small freestanding heaters or be more decorative like a lamp. They are usually under three feet tall and can run on propane or electric. These types of heaters are best for occasional use as they are easy to store and use as needed. They don’t put out as much heat as a full-sized freestanding heater and are good for small gatherings around a picnic or sturdy patio table. Wall mount heaters are typically electric. They can be mounted on a wall or ceiling. Some models do come with a stand which makes them portable as long as there’s an outlet. Wall-mounted heaters are good for small spaces, such as balconies or under gazebos, where there isn’t enough room for a freestanding or tabletop unit. How Safe are Patio Heaters? 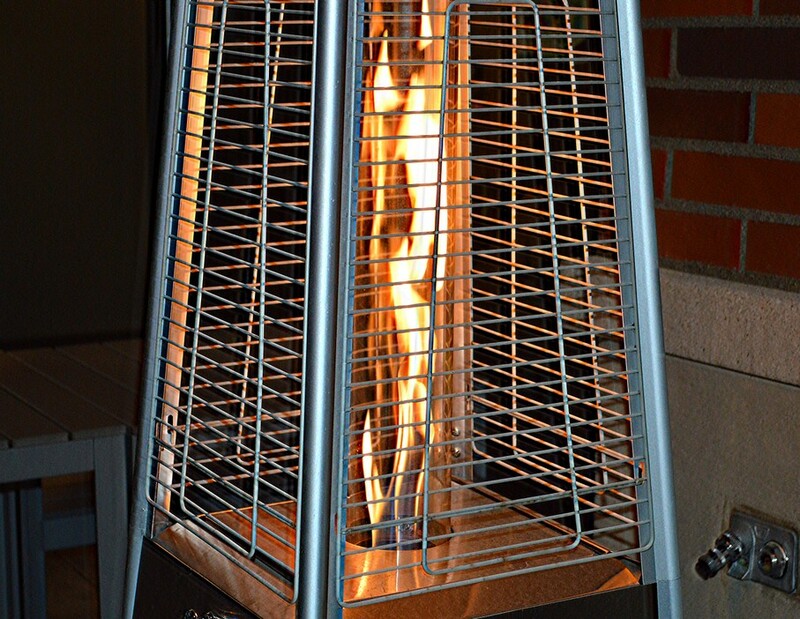 Modern patio heaters have many safety features to prevent burns and fires. Most have a tilt shut-off valve that will shut off the heater if it’s knocked or blown over. Some have an automatic shut-off switch that will turn the heater off if it gets too hot. Patio heaters do get hot and will need to be placed away from combustible items such as awnings, sun shades, and umbrellas. It’s recommended to have 30 inches of clearance on all sides. Tower heaters may have glass doors to protect from accidental burns. These doors are made of glass that does not get hot and are safe for children and pets. Although not designed to keep you warm at temperatures below 40 degrees, a patio heater can keep the party going when it starts to get a little chilly. Enjoy your deck or patio year round or a least a little longer by purchasing the correct size and style of patio heater that’s right for you.